Welcome to Legacy Dental in Lethbridge! Our dental team at Legacy Dental has been serving the community for years. How did we come to be? Dr. Ian Miller provides some insight! Dr. Ian Miller began practing dentistry when he joined his father’s Lethbridge practice in 1996 after earning his Doctor of Dental Surgery degree from the University of Alberta. “It was special to get to work with my dad,” he says. 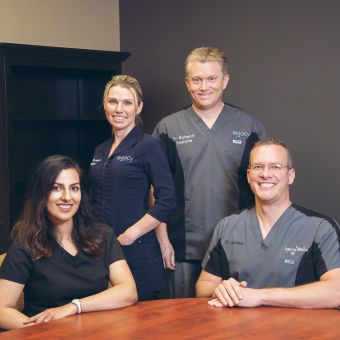 Shortly after, Ian opened his own practice, Legacy Dental, and was soon joined by fellow Lethbridge native Dr. Noreen Richter, and Dr. Richard Boehme who have been with him for years. Many of the administrative staff, hygienists, and dental assistants have also worked with Ian since he began his practice almost 20 years ago. Now, the friendly and dedicated team is excited to welcome their newest dentist, Dr. Sihota this August. “We want to ensure Lethbridge and surrounding areas have access to dental care, so we’ve expanded our team with additional talent to join Dr. Richter, Dr. Boehme and I. Dr. Sihota has been practicing dentistry for 10 years and will be providing Friday appointments to help meet patient schedule needs,” he says. With the expansion of the team, more hours, free parking, and an accessible location off Highway 3 and 43rd Street, the clinic prides itself on providing convenience and leading technology so patients can maintain their oral health. In addition to the digital scanners and lasers, the facility also has a relaxing waiting room and a special play area for the younger crowd. Legacy Dental provides an array of services for all dental issues, including general dentistry, cosmetic services, orthodontics, Invisalign®, and dental implants. They also offer CEREC same-day crowns. 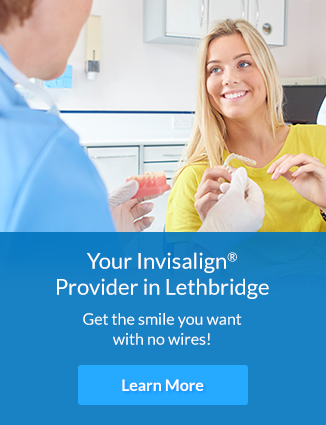 “We are one of the few clinics in Lethbridge that can provide our patients with crowns and veneers in just one visit,” says Ian. “This saves patients the inconvenience of having to deal with temporary crowns and multiple visits.” With an additional focus on Invisalign® for adults and teens, Legacy Dental is evolving to meet the dental needs of the community. To meet our dental team, call our office or stop by any time. We would be happy to answer any questions you have about your dental care and oral health.